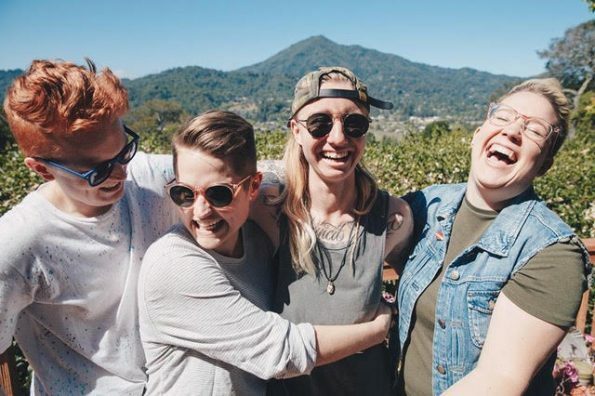 San Francisco’s The Total Bettys are back with their 2nd full length LP This Is Paradise. The quartet is anchored by the long-time partnership of Maggie Grabmeier and Reese Grey, beefed up with the airtight rhythm section of Chloé Lee and Kayla Billos. Their debut EP Connect With The Couch appeared in 2015, followed up by the full-length debut Peach in 2017, bringing us up to the present day. The one-two punch of “Am I Glowing” and “One Less Mistake” sets the pace; it’s sharp, confident, and stuffed with guitars, never relenting. Even when dialing back the tempo (“Know Me”), they’re growing an innate melodic sophistication, moving beyond pop-punk to power pop-punk, if you will. Despite the gloomy post-breakup themes, the ever-buoyant tunes can’t help but imbue optimism, even in the darkest moments. The core of the LP is the sequence of “So Much Better,” “Best Friends,” and “Grown Up” that showcases all the band’s strengths. Regrets, they’ve had a few, but Total Bettys head resolutely forward on This Is Paradise. Exciting times ahead for the band, as they will make their way to Boise, Idaho in March for an appearance at the 2019 Treefort Festival.